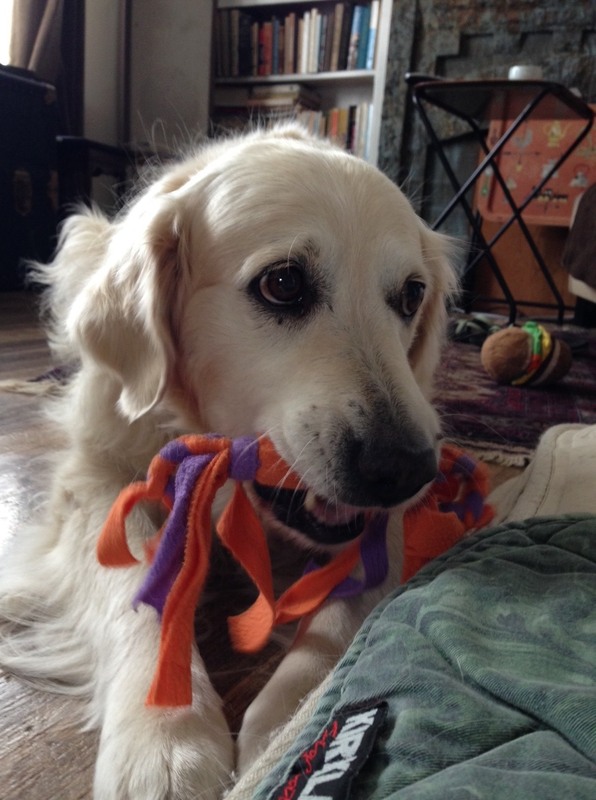 Jana is the original Thinking Dog and the inspiration for this blog. Now 11, Jana knows that she is a princess and loves to be in charge. She is not the typical loves-everyone golden; Jana is very analytical and thinks things through carefully. This includes a thorough assessment of new people before she decides whether she will allow them to befriend her. And, of course, only friends may actually pet her. Jana was born in Tzur Hadassah, Israel, and moved to the United States shortly before her second birthday. She has a strong work ethic but demands prompt payment (in food) for her work. She is loyal and can be very sweet and affectionate, once she has decided that you are her friend. If she gives you an effusive greeting, or voluntarily cuddles with you, you are definitely on the “A” list. Guiding Eyes Alberta, born April 25, 2011, boasts a pedigree of more than 10 generations of purpose-bred guide dogs. She excelled in her early puppyhood education at Guiding Eyes’ Canine Development Center and advanced to living with puppy raiser Lisa McMains and family when she was 8 weeks old. She learned many skills that serve her well in her current career as guide to Deni Elliott. 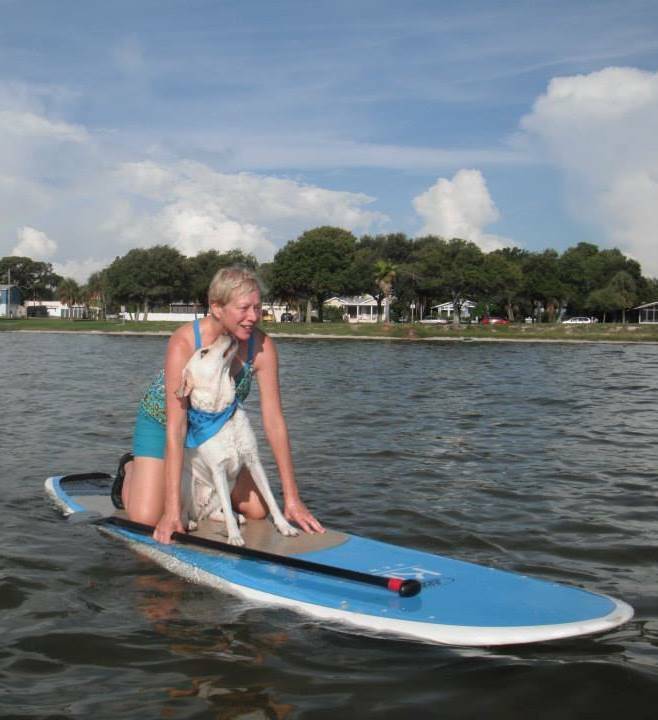 Always the athlete, as a puppy, Alberta trained hard in the sports of dock diving and unrolling toilet paper. She excels at Rally and has recently added stand-up paddleboarding and riding along in a golf cart as Deni golfs to her sports repertoire. A precocious girl, Alberta was recalled to Guiding Eyes for training at only 14 months of age. She considered giving up her career to raise future guide puppies, but chose a working life over motherhood. Alberta began working with partner Deni Elliott before her second birthday. Keep up with Alberta’s adventures on the Guiding Eyes blog and Facebook page, where Alberta makes frequent appearances. 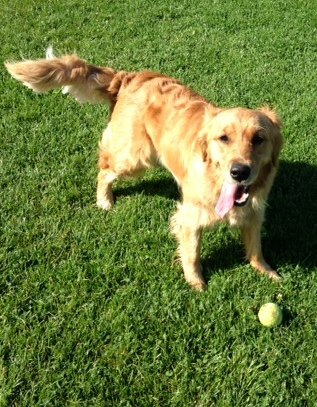 Cali, who is not quite two, has yet to settle on a specialty, sport, or career. She has resoundingly rejected both service work and motherhood, however, she is seriously considering therapeutic work as a visiting dog. 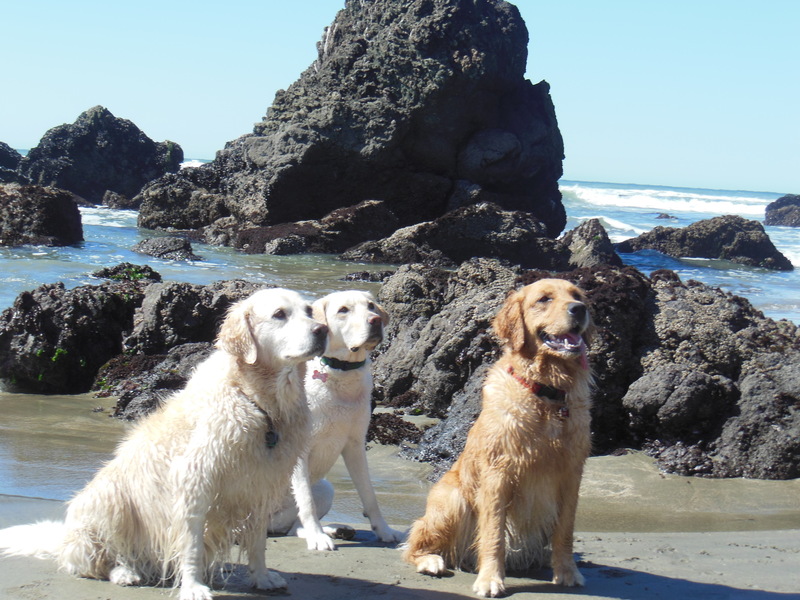 The quintessential golden retriever, Cali has no concept of a “stranger” and has declared that her mission in life is to meet every single person on the planet. She is the happiest dog I know, and her sunny optimism goes a long way to mitigate potential annoyance over her penchant for eagerly greeting each new day well before the sun is up — always with a toy at paw (or in mouth). Cali, too, is an aspiring athlete. She is a driven ball-chaser and a star at beginning scent work.